The 6", silver MIXIT Metallic Lightning to USB Cable from Belkin lets you charge and sync all your Lightning connector devices quickly and safely, with just one cable. Simply plug the USB end directly into any USB port to stay connected while you are at home, at work, or on the road. You can sync music and pictures to/from your laptop in seconds. 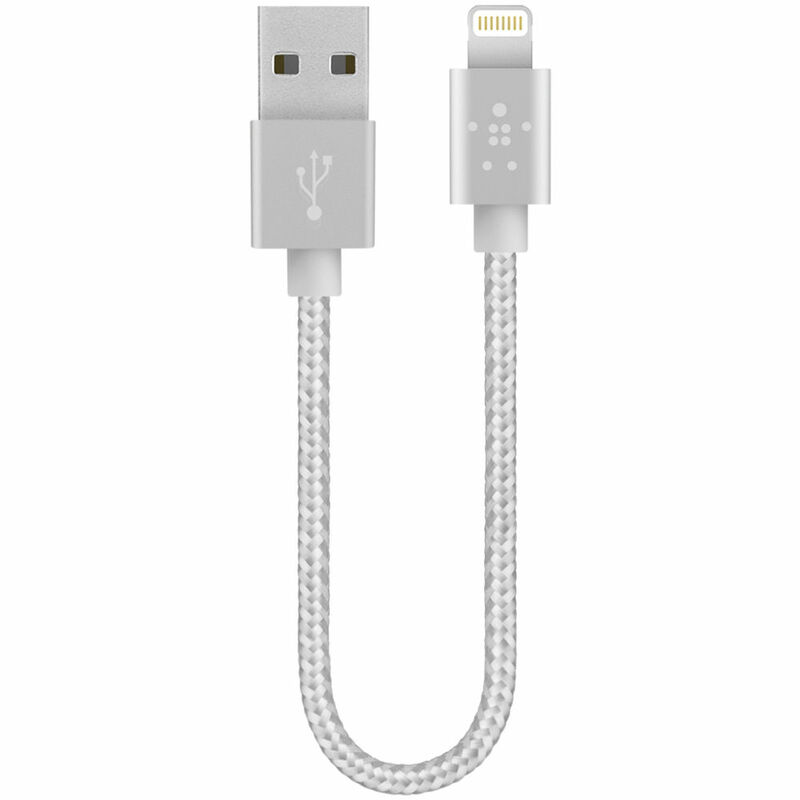 Use the Lightning to USB cable to charge your compatible Apple device at fast speeds. Plug it into your laptop to charge and sync, use your own wall charger to charge from the wall, or plug into a car charger and charge on the road. It can be used as a replacement cable or if you simply need an extra. The cable is compact enough to toss in a bag and go, and plugs into any USB port, so you can use it virtually anywhere. Depending on the type of case you have, you may need to remove your case before charging. If your speakers, connector port, and AUX port are fully exposed when your case is on, you should be able to easily charge and sync your device without removing the case. Box Dimensions (LxWxH) 5.6 x 4.1 x 1.0"
MIXIT Metallic Lightning to USB Cable (6", Silver) is rated 2.2 out of 5 by 53. Rated 1 out of 5 by CindyA from Very poor quality I purchased this cable in the 1.2 meter rose gold for use with my daughter's iPhone 6 and it is fraying already. Also, it is not very pliable and had kinks in it right out of the box due to the way it is packaged. I kept it because the kinks did not seem to affect performance and I thought they would straighten out with time. However, now the rose gold cording is frayed in places and the plastic sheathing underneath is completely exposed in 2 areas where there are permanent kinks. I cannot return the cable as it is outside the 14 day return period, but I am seriously disappointed in the quality of this item. I expected better from Belkin. Rated 1 out of 5 by musicmoon from Glorious, fast charger for 2 months. I bought this cable in gold a few months ago because I have used a belkin cable for my android phone before and it was really good quality. I was really happy with how fast it charged my phone and how glorious the gold looked but I am very disappointed as this cable has a break in the line already and refuses to charge unless held in a certain way. I replaced my wall charger and portable charger thinking that the chargers were to blame for this issue but even with new chargers it still struggles to charge. I wouldn't recommend this cable because it hasn't lasted long enough for me to be satisfied with this product. Rated 5 out of 5 by Iron Buckeye from Durable I don't understand the other reviews -- people must be chewing on their cables or using them to bundle firewood. I've used two of these cables in each of my two cars for a couple of years and never had any problem with them. They get limited but normal abuse (occasionally yanked when the phone falls on the floor, plugged in/out multiple times per trip, center console lid closed on it, etc). Never had any problems and they're not showing any signs of wear. My fiance just got a new car and asked "where do I find those really good cables you have in your cars?" This is the place. If you run cables over with a lawnmower or otherwise beat the heck out of your stuff, then you better buy cheap cables because EVERYTHING you use will fail. But if you're looking for something that will hold up long term to normal use, this is your cable. Rated 2 out of 5 by missme from Disappointed I bought two of these cables at the same time about 3 months ago and one is still working fine, but the other I have about a 50/50 shot at it charging my phone. I thought it might be the phone or something else but I have tried other cables and my phone charges fine and I have tried plugging the cable into other outlets and it does the same thing. If fact in some of the other areas I plugged it in it would give me the signal that it is connected and charging every few seconds. It is really weird and I have always been a fan of the product just not this cable. The extra stars is because my other cable is still working. Rated 5 out of 5 by Lynnie from Beautiful Cable I purchased this cable to be used with my battery pack. I bought it when it was first released and it still works great and is beautiful. I've decided to purchase a second one since my pack has two outlets. Note: the cable does behave like a wire and is bendable (if I bend it into a U shape, it will slightly hold that shape). I do not recommend this product if it will be thrown into a backpack (like my son would do) or crammed into a small pouch or pocket. I keep mine in it's own little bag along with my battery pack. I just roll it back into a coil and my 6" one is stored in a U shape. Rated 1 out of 5 by Vimal from Cables wouldn't charge out of the box 3 Brand new MaxIT Metallic cables. Opened them about a couple of weeks ago, though I bought then in March. 1 Cable doesn't charge my phone or sync, the other work for charging but don't Sync. This is out of the box condition. I have multiple belkin products, as I believed that they should work by the looks of them... Looks like looks can be deceiving. This was the same case with the two 6" MaxIT cables I had. I though it was my using that caused them to fail... I should have read the review before I threw them and when out to buy new cables. Quite disappointed and didn't expect this from a company like Belkin. Rated 4 out of 5 by bchrunr from A premium cable to match my rose gold iPhone 6S I bought the MIXIT↑™ Metallic Lightning to USB Cable in rose gold to match my new iPhone 6S. I love the braided cable, which is on trend and has a luxurious hand. I've has mine for a little over 6 months. Never have had an issue with charging any of my Apple devices. I've been told to only purchase MFI certified accessories to use with my devices and while they may be a bit more expensive, I know that Apple has approved them and I feel safer. I gave this cable 4 stars instead of 5 because there is some fraying happening at the top near the lightning connector.